Rare white-flowered variety of borage. Attracts insect pollinators and can be used in the same way as regular borage. Flowers slightly later than blue-flowered borage. 11-13 weeks to flowering. 20 seeds per packet. Borage leaves are edible, they have a cucumber-like flavour and can be eaten raw in salads or cooked as a green vegetable. Pick young leaves only as older leaves will be hairier and less tender. Borage leaves can be dried, coarsely ground and stored in an airtight container to be later used as a dried herb. Borage flowers are edible and have a sweet flavour due to their nectar content. All edible parts of the borage plant should be consumed in moderation as they contain Pyrrolizidine alkaloids which can be toxic to the liver if eaten in excess. 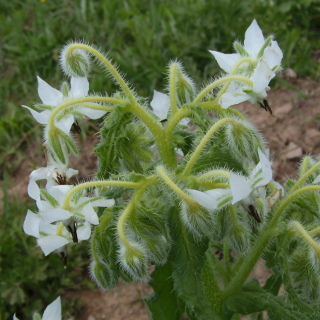 White flowered borage attracts and provides a nectar source both for insect pollinators as well as the adult stage of predatory insect species such as hoverflies and lacewings. Borage makes a particularly good companion plant to tomatoes as the scent of the leaves confuses the adult stage of the tomato hornworm moth, preventing them from laying their eggs. White flowered borage will grow and flower best when planted in a location that receives full sun or light shade. Growers in warmer climates are advised to plant borage in a location that receives light shade to reduce heat stress on plants during the hottest part of the day. Borage requires a free draining soil to grow well and will rot in waterlogged conditions. If you soil is heavy in clay or compacted you can improve its structure by placing down a layer of compost or well-rotted manure prior to planting borage. The organic matter will be incorporated through the soil below by worms and other soil microorganisms. Fertilise white flowered borage regularly by top dressing with a complete organic fertiliser or by applying an organic liquid fertiliser, worm juice or compost tea to plants. White flowered borage will die back during Winter but will self-sow if growing conditions are favourable. Water borage plants if the leaves are wilting, do not over-water as the roots may rot. Mulch around borage plants to suppress and reduce competition from weed growth. In cold and temperate regions of Australia sow white flowered borage seeds during Spring and Summer. In subtropical and tropical regions of Australia sow white flowered borage seeds during Spring, Summer or Autumn. Sow white flowered borage seeds 7mm deep spacing plants about 35cm apart. White flowered borage seeds germinate quickly and consistently with most seedlings emerging 7 to 12 days after sowing. White flowered borage plants take 11 to 13 weeks to begin flowering.